I just like it! So I vectored Yuko (10-15 hours), and I thought since a long time about the BG. And congratz, I think you are better now. Fantastic work. People have forgotten what a WALLPAPER should be with so many boring being done lately. This is not boring at all. Worthy of being on my Desktop wallpaper. :) Many thanks. Great work on the shading! You got some really nice effects on the obi. Very clean and soft with your line work. Good job! i love your colouring! very nice! This is really beautiful, from shadings to pose and great use of patterns. Just one thing you may want to fix. In the left part of her head there's a need for more hair, the head looks oddly cropped without it. 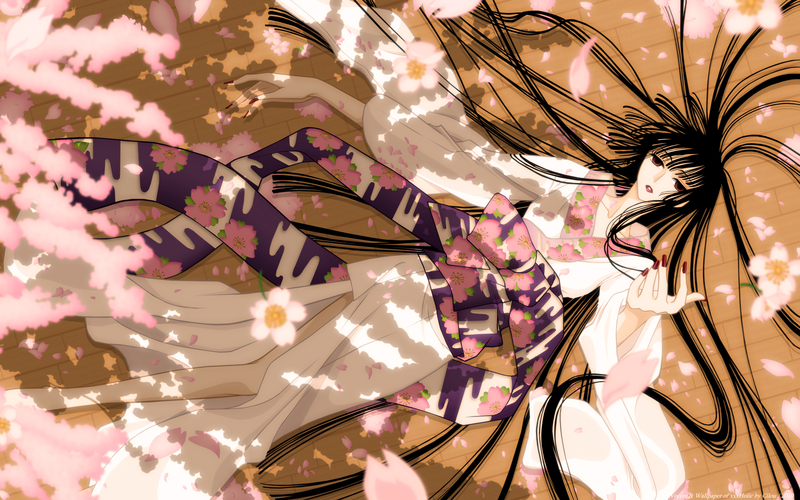 Yuuko's face is very clean and lovely, and the falling cherry blossoms create a beautiful atmosphere. However, the lines on her obi are WAY too sharp and jagged with angles; since the rest of the piece is so delicate they really stick out and detract from the wallpaper. Absolutely gorgeous! Thanks for the upload!